The Øresund Bridge (locally called Øresundsbron) connects Amager and Oresund in Denmark (on the island Zealand) with Skane, Sweden, a total length of just more than 10 miles (16.4 km). The road across the Oresund Strait connects the metropolitan areas of Copenhagen and Malmo. 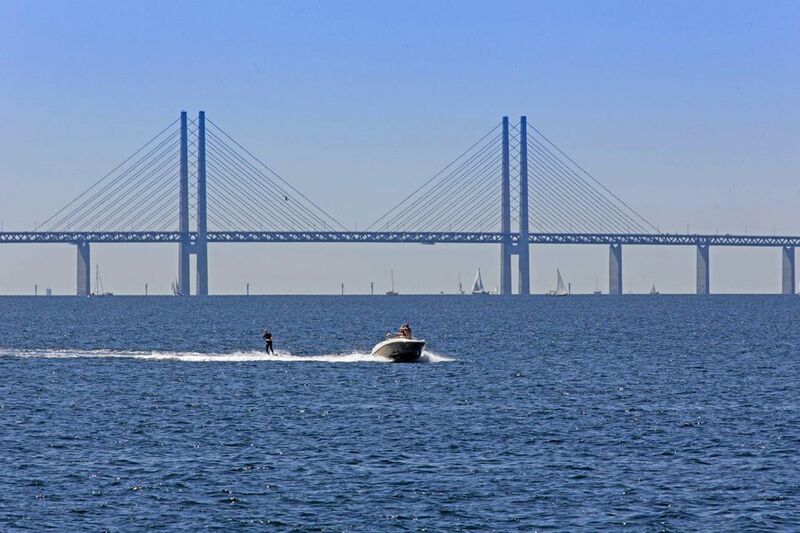 Perfect for travelers wanting a quick connection between Sweden and Denmark without flying, the Øresund Bridge carries more than 60,000 travelers daily, both local commuters and tourists. The Øresund Bridge supports a four-lane road on the upper deck carrying 6 million vehicles per year, and two train tracks on the lower deck transporting another 8 million people each year. Crossing the bridge by car takes about 10 minutes; the train trip between the Malmo and Copenhagen stations takes about 35 minutes. In 1991, the governments of Denmark and Sweden agreed to jointly construct this massive project, and while it took a while, the Oresund Bridge officially opened on July 1, 2000. Building the Øresund bridge included construction of the elevated section, which extends for about half the length from Sweden; the tunnel (2.5 miles long / 4 km) crossing the rest of the way to Denmark, and a new artificial island named Peberholm linking the two where travelers transition from tunnel-level (on the Danish side) to bridge-level on the Swedish side. The Øresund Bridge's local name "Øresundsbron" is a combination of the Danish word "Øresundsbroen" and the Swedish word "Öresundsbron," both meaning Oresund Bridge in English. Travelers can purchase single-use or multiple-use toll passes for the bridge. Single-use toll passes for cars up to 6 meters, or just under 20 feet, in length cost EUR 50 as of April 2018; larger vehicles up to 10 meters in length (32.8 feet) and those towing trailers with a combined length of 15 meters (16.4 feet) or less cost EUR 100. Vehicles longer than 10 meters in length or greater than 15 meters with a trailer cost EUR 192. Prices include a 25 percent VAT. Besides a popular annual bridge discount subscription (called BroPas) aimed at commuters, travelers might want to consider purchasing a 10-trip pass with a 30 percent discount. Travelers pay the toll for driving across the Øresund Bridge at the toll station on the Swedish side, with both cash and credit cards accepted. Border checks also take place at the toll station, and everyone crossing the bridge must carry a passport or driver's license to enter Sweden. Though delays and closing rarely occur, you can check the bridge traffic and toll information before you travel. The high bridge part of the Øresund Bridge has the longest cable-stayed main span of all bridges in the world. That goes for both road and rail traffic. And the tunnel part of Øresundsbron is the world's longest underwater tube tunnel, also for both road and rail traffic. The artificial island of Peberholm, constructed as the link between the bridge and tunnel sections, has become a vital habitat for endangered species such as the black-headed gull, which established a colony there with up to a few hundred mating pairs. Since 2004, the rare green toad has also been spotted on the island, now one of the largest populations in Denmark.